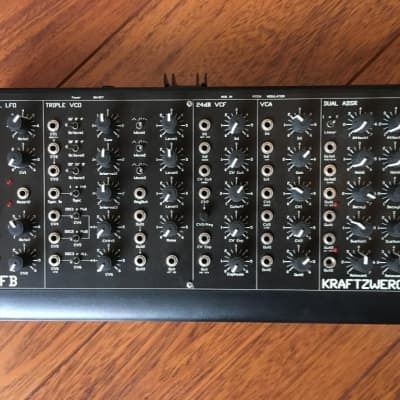 The KRAFTZWERG module is the Euro-rack compatible version of our semi-modular analogue synthesizer of the same name. It fits into any standard Eurorack frame with 3 rack units in height and can be used as part of a modular synthesis-system. The module works as a complete monophonic synthesizer with powerful options that can be expanded and controlled through CV-inputs of other signal sources and modulators like analogue sequencers. On the other hand, it is also possible to use the module’s different sections independently in combination with other modules. The KRAFTZWERG module can be used alone, even without the need to use any patch cords. The classic routing VCO-VCF-VCA as well as most popular modulations is internally prewired. Small labeling below the input jacks will indicate any existing prewiring with its destination.